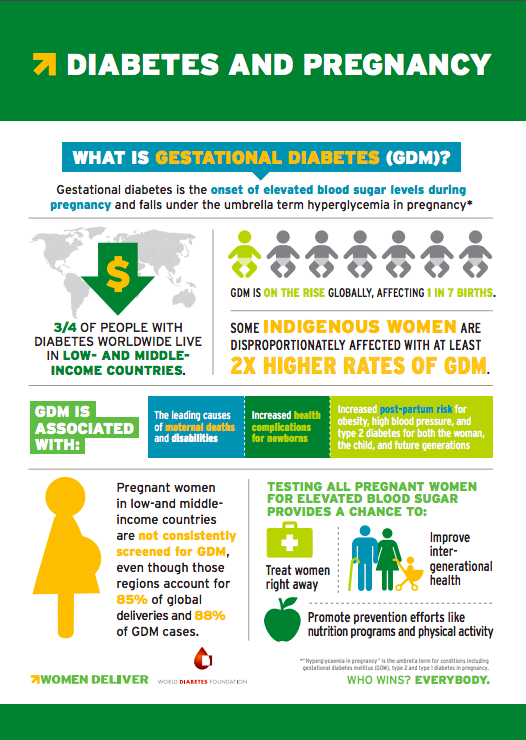 Diabetes triggered by pregnancy affects 1 in 7 births — and the vast majority of women affected live in low-and middle-income countries. Women with unmanaged diabetes in pregnancy run a higher risk of having infants with excessive birth weight, or macrosomia, which can lead to complications such as obstructed labor and an increased risk for maternal and newborn death and disabilities. In the long term, unmanaged diabetes in pregnancy will contribute to the rising global burden of non-communicable diseases (NCDs), as more than half of all women with gestational diabetes (or onset of diabetes only during pregnancy) will develop type 2 diabetes within five years of delivery. Ultimately accelerating progress towards Sustainable Development Goal 3: promoting healthy lives and wellbeing for all at all ages by 2030. Together with the World Diabetes Foundation, Women Deliver seeks to elevate the issue of gestational diabetes.